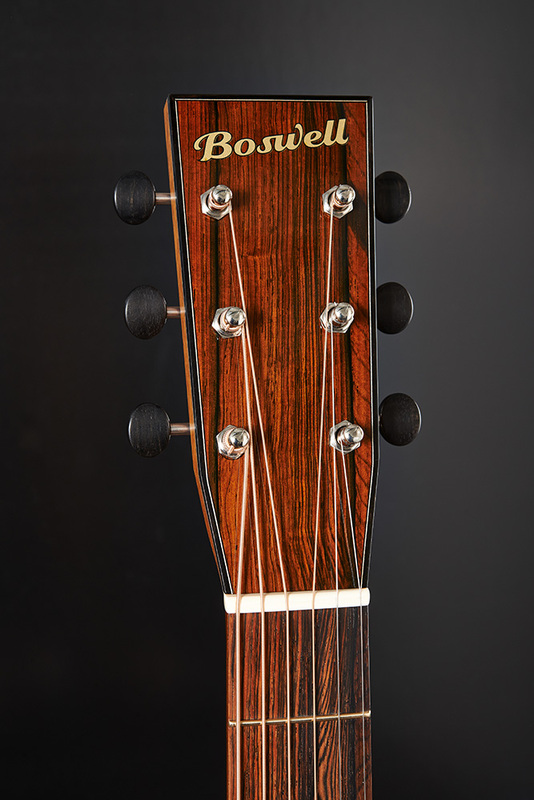 Boswell guitars are generally broken down by size, and grounded firmly in flat-top acoustic guitar tradition. The models offered are listed below. Each size can be modified with custom options (cutaway, sound-port, beveled upper bout, body depth, etc...) to suit the players needs. 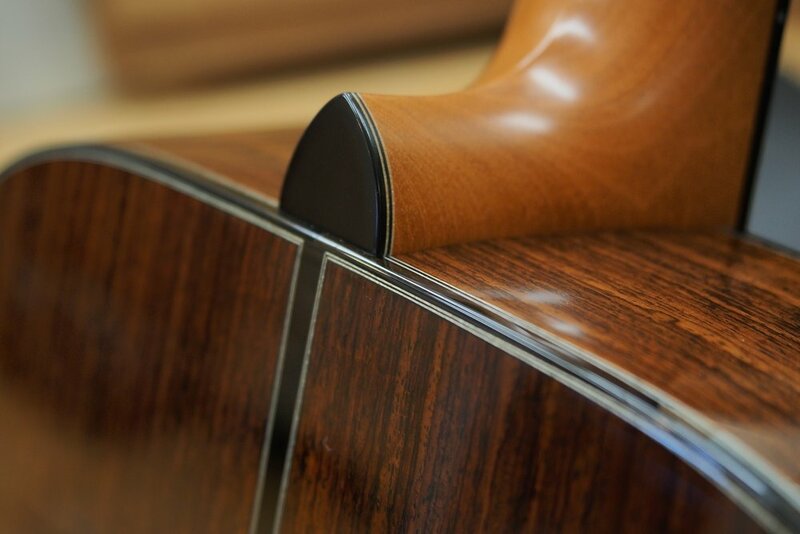 Each instrument is built completely by hand, sourcing only the highest quality, old growth materials possible, and put together with the highest attention to detail. 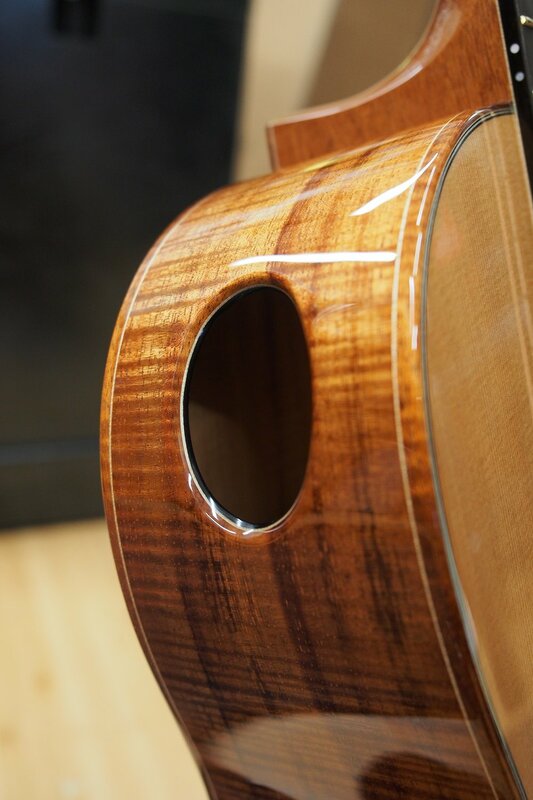 Hide glue is the only adhesive used, and every instrument is finished in 100% pure, un-catalyzed nitrocellulose lacquer. Every guitar I make is essentially a “Custom Shop” instrument. Meaning, there is no standard model. Each one is tailor made. The process requires a solid understanding of what each player is after, and in turn becomes a personal experience for both myself and the customer. Models, options, and wood selection are all just the basic starting point. The Model T was originally designed for serious traveling musicians that don’t always want to lug their full-size, high-end instrument around with them from place to place. 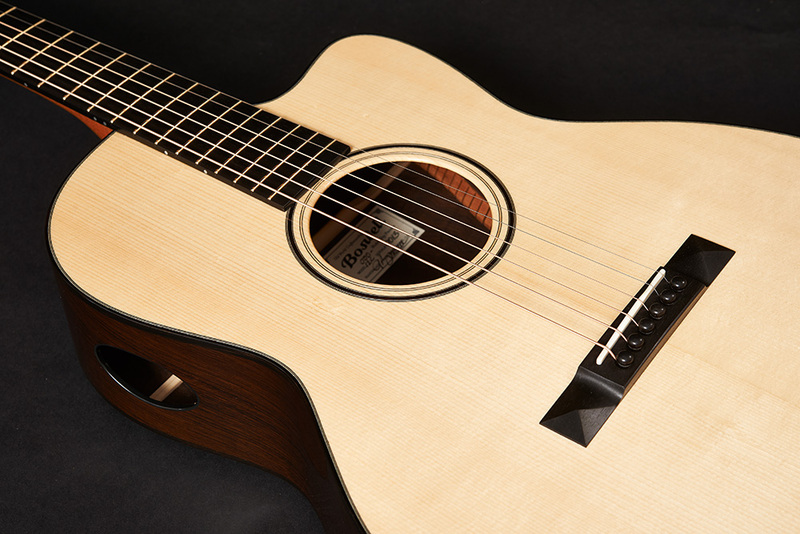 A high-quality playing, looking, and sounding guitar in a small package. In a gig bag, it can fit in the overhead on a flight, although I’m not necessarily recommending that! This is not your average travel guitar, though. Built with the same quality of tone woods as my other full size instruments, and of course with the same attention to detail. However, I usually try and use some less expensive wood combinations to help keep the cost down below my normal strategic price for full sized guitars. 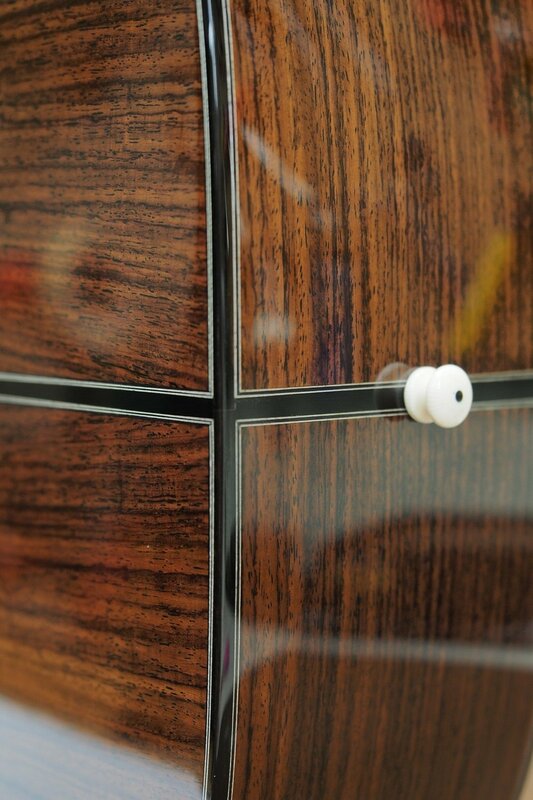 The one pictured is made from some moderately figured Honduran mahogany, all cut in sequence from the same board, and then trimmed out in African ebony. With its 24” scale, the “T” has a wonderfully sweet tone, and a surprising amount of volume. The perfect hotel guitar! Stunningly beautiful in both style and tone, the 00-12 has the timeless appearance of smaller, simpler vintage guitars from long ago. However, the comparison ends there. The tone of the 00-12 is anything but simple. Exceptionally balanced with complex overtones, and sustain and breath that seem to go on indefinitely. 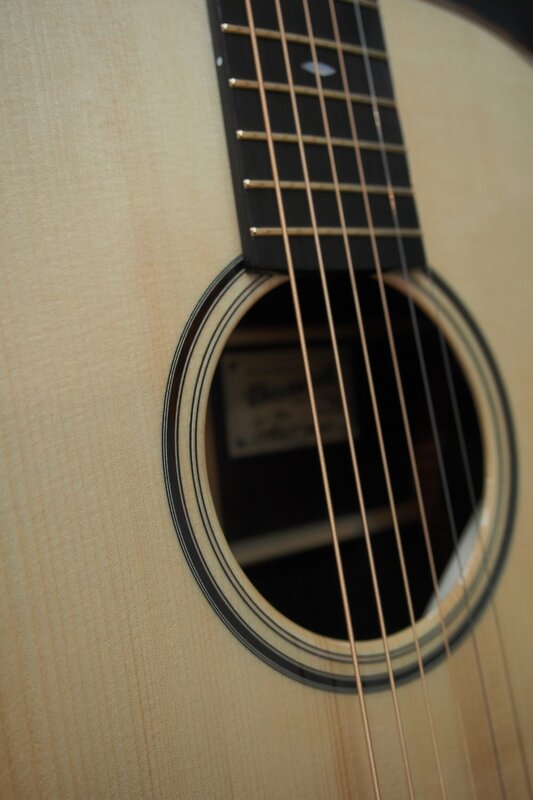 The 12 fret 00 is a beautiful little guitar, perfect for moving between the studio and the den. The smaller body size, 12 frets to the body, slotted peg head, and 24.9” scale length all combine to yield one little guitar with a lot to say. 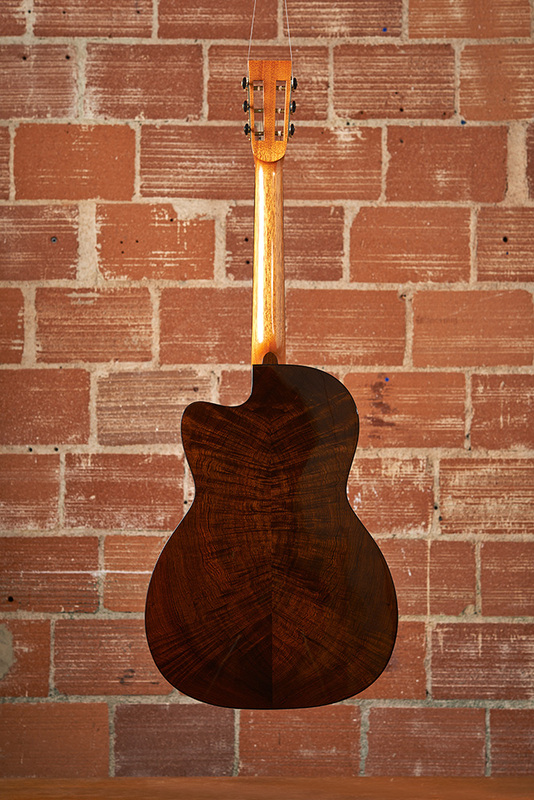 The model pictured features a stunning set of high-flame Koa, a Cedar top, matching tiled-mosaic sound hole rosette and end-graft (in African Blackwood, Koa, and Brazilian Rosewood), a layered sound port, my pyramid style ebony bridge, Florentine style cutaway, and my squared-style heel shape with high-flame heel cap. Perhaps my favorite guitar to both build and play, the 00-14 builds on the already fantastic 00-12. With 14 frets to the body, the 00-14 has a little more access past the 12th fret. The smaller box, combined with the 24.9” scale length, delivers a playful little guitar with a strong and powerful midrange, perfect for recording. The solid peg head has a touch more mass, and the sustain and overtones are truly amazing. While the 00-14 does excel in the studio, I would consider it my hands-down favorite “couch” guitar! Incredibly responsive to light finger-style play, yet bold and powerful enough for aggressive flat-picking and strumming. 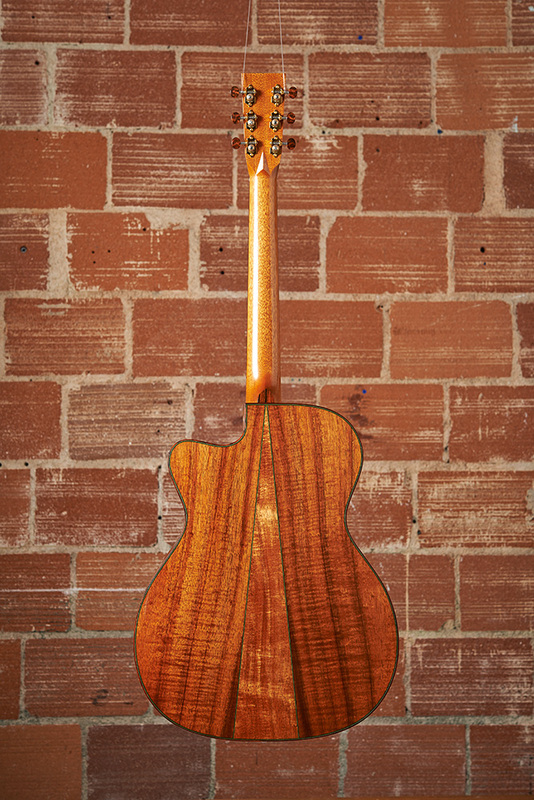 Pictured is the 00-14 in master grade high-flame Koa back and sides with a Tunnel 13 Redwood top, adorned in abalone purfling on both the top and back, an African Blackwood fingerboard and pyramid style bridge, high-flame Koa peghead overlay, slightly deeper body design, squared heel design with an African Blackwood heel cap, and bound body and headstock in African ebony. Similar in it’s vintage appearance to the 00-12, this bigger brother packs more of everything. The elongated body and increased chamber space combine to provide greater overall volume and bass response, while the slotted peg head helps to keep the tone open and uncluttered. The 24.9” scale length gives a playful left-hand feel, and when played finger-style, each note rings with power and intention. The clear and well rounded midrange ties the bass and trebles together delivering a complex wave of notes and overtones truly enveloping the player. Add a sound port, and you’re in finger-style bliss! This particular model does just that, and has a killer set of Brazilian rosewood back, and sides, a German spruce top, Venetian cutaway, ebony bound peghead and body, and African ebony fingerboard and pyramid style bridge. By far, the most ordered guitar I make, and quite possibly the most versatile. This model seems to be the flagship of the Boswell line, and can be modified to suit the most demanding of players. Add a cutaway for accessibility past the 14th fret, a deeper body for added bass response, a sound port for added player volume, or a lower-bout forearm bevel for added comfortability. The possibilities are limitless. The 000-14 has the traditional 24.9” scale length of the earliest versions, keeping access between frets easy, and the left-hand feel comfortable and forgiving. Dynamic and bold when played finger-style, powerful and loud when strummed hard or flat picked. Clear as a bell with incredible balance and string-to-string separation, great for recording, composing, and live venues, this classic beauty can do it all. When setting out to design my own 12-string model, I instantly realized I was headed down the rabbit hole! However, I knew what I was going for, and what I really wanted to achieve. With the combination of a smaller body (OM/000), a shorter scale length (24.9"), and my own bracing design (forward shifted, interlocking double X pattern), I was able to get exactly what I was hoping for. This is no ordinary "jangly" 12-string. It's got plenty of bass and mid-range punch, something I find missing all to often in a typical production 12-string, with a silky smooth treble. Not edgy, or overly bright like many of us have come to expect from 12-string guitars. This is a very special guitar. Pictured below is my 000-14, 12-string with an Engelmann spruce top, German spruce bracing, and Madagascar rosewood back and sides. 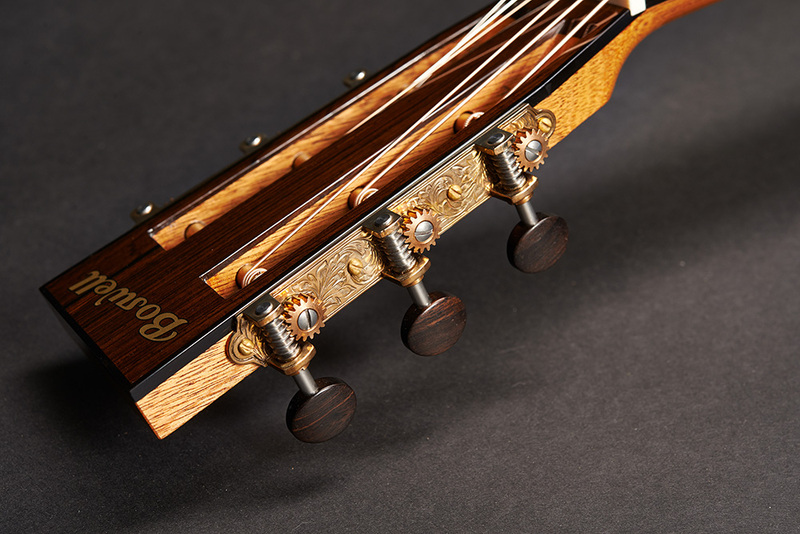 The fingerboard, bridge, peghead overlay, and binding is all Brazilian rosewood (along with the bridge plate as well). Also, this particular model is outfitted with an edge bevel, and sound port. If you’re looking for the versatility of the 000-14, with added volume, the Orchestra Model may be the one. The 25.5” scale length increases the tension and top loading, in turn adding more rotational force at the bridge plate and X-bracing. These added forces push more air in the chamber increasing the volume, and adding a slightly more predominant bass and midrange spike. I often look at the OM as a slightly smaller and more comfortable D. An excellent instrument for live, and louder “ensemble” situations. Ask for something from the OM, and it will continually give more than expected. Pictured is my OM in East Indian rosewood back and sides with a Master old-growth Adirondack spruce top, fully trimmed out in African ebony. 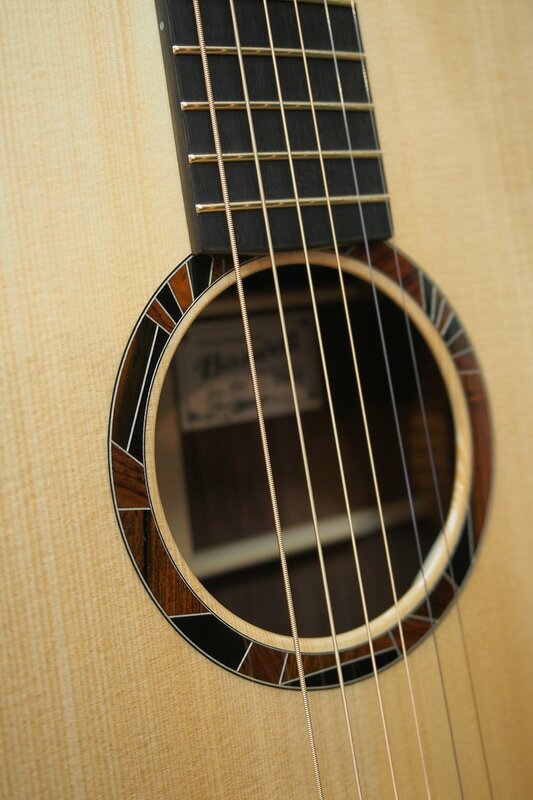 Notice the “3-Sisters” inlay at the 12th fret, my tribute to my new home here in Bend, OR, and my tiled-mosaic sound hole rosette in African ebony, Indian rosewood, and Brazilian rosewood. 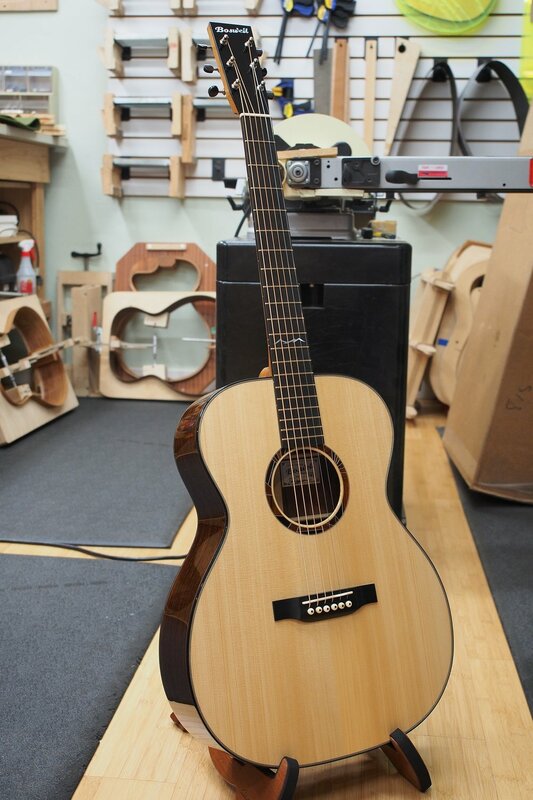 With the introduction of the model D in the mid 1930s came a new era in guitar building. One where the guitar was intended to be powerful, and have enough volume to compete with other instruments and vocalists in the most demanding of situations. 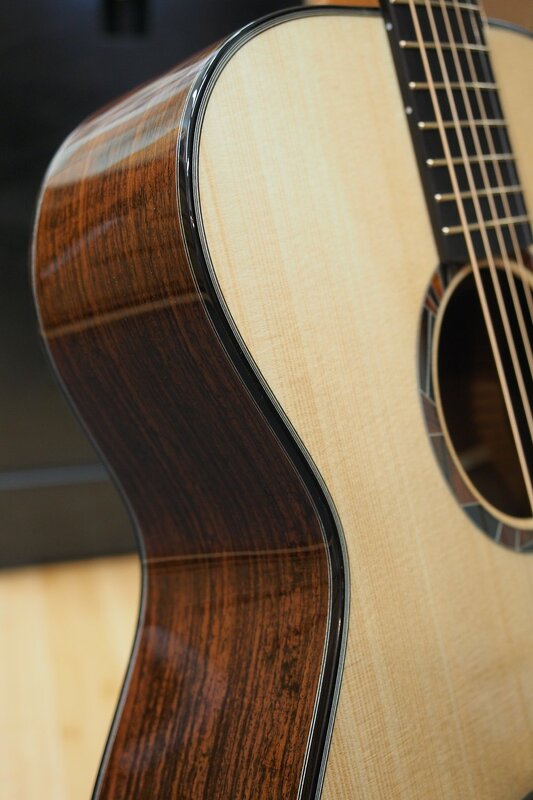 Today, the traditional square-shouldered D has to be one of the most recognizable guitar shapes in the world. It symbolizes power, volume, and clarity, and carries with it the reputation brought about by players like Tony Rice, Clarence White, and Doc Watson. Just like all the other guitars we make, the D is constructed with the finest of materials aged naturally, and assembled completely with hide glue...every joint, not just the top braces. 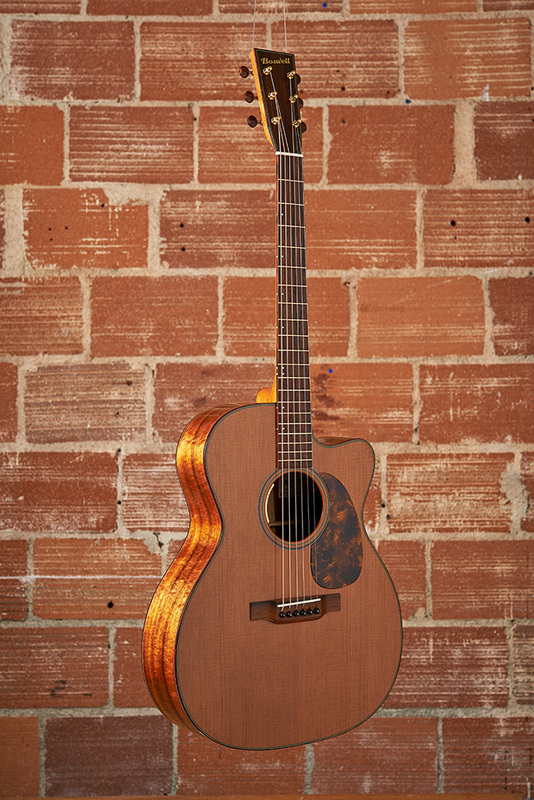 I don’t just want to make a dreadnaught as good as the ones from the “golden-era” of guitar making. I want to make one better. Below is a short list of several options we regularly encounter. Please don’t feel that this list is all encompassing. If there is something you are after and don’t see it below, don’t hesitate to inquire. Materials may not be everything when it comes to guitars, but for me, they are certainly near the very top. 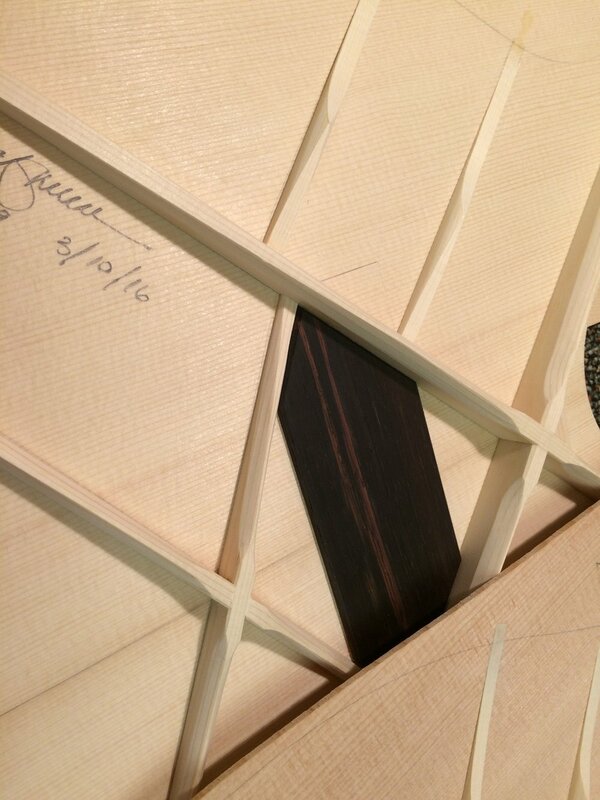 I constantly search for the highest quality tonewoods on the planet. I don’t always use the oldest stuff around, but why use woods that have been aged artificially when you could possibly find the same material aged naturally? In the case of tonewoods, older is definitely better! Stable, tonally superior, and the grain that builders looked for 75 years ago. It may be a bit more expensive to have wood of this caliber, but well worth it! Boswell Guitars, 15 NW Franklin, Unit B, Bend, OR 97701. (541) 719-1289.